A motorist who chooses to travel on a bicycle as much as possible. ← Video evidence: why we need a wide field of view. In December of last year, Chris Boardman, who last summer took on the role of Walking and Cycling Commissioner in the office of the Greater Manchester Mayor, published his report, Made to Move, in which he sets out ambitious plans for enabling and promoting walking and cycling across the region. The first part of putting those plans into action is to consult widely across the 10 local authorities in Greater Manchester. 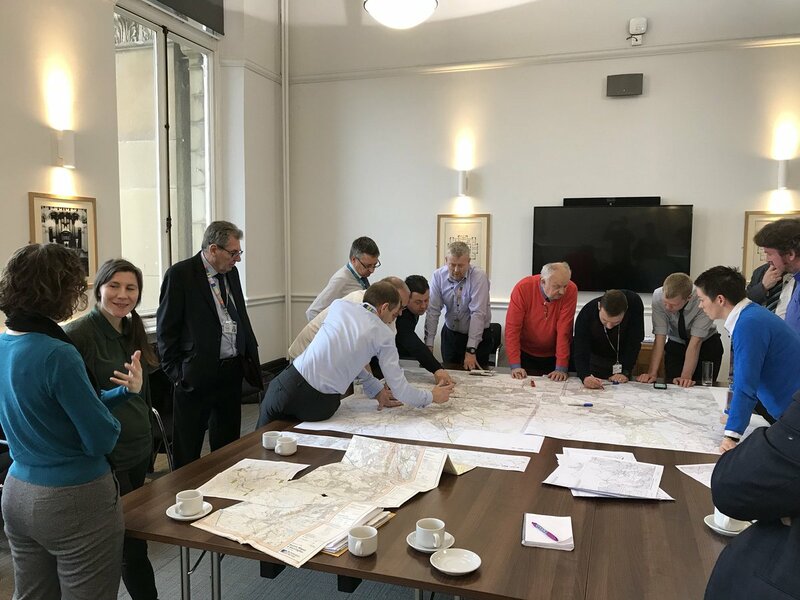 On 11th of April, it was Bolton’s turn to be consulted by Chris Boardman’s team with the aim of creating plans for a walking and cycling network across the borough, and I was fortunate to be able to attend the meeting. The picture below was kindly posted on Twitter by Mark Key, an advisor to Chris Boardman and part of the team; I can just be seen leaning across the table on the left, mostly hidden behind our borough’s Cycle Officer. A look at the photograph reinforces a comment that has been made about previous meetings in the series: that most of the participants seem to be white men of a certain age. This is disappointing as it is important to engage with a good cross section of the community, particularly in a town as culturally diverse as Bolton. Anticipating this, I had asked them to invite a female bicycle user whom I know from Twitter, but unfortunately she couldn’t make it on the day. Having said that, the women present made their presence felt to the benefit of the workshop, especially in relation to the walking aspects. The latter can tend to be under-represented as the first port of call in recruiting “user” participants often is the local cycle forum. Indeed, when Brian told us that this was about walking as well as cycling, one of the councillors suggested that we had a problem because there were no walkers present. 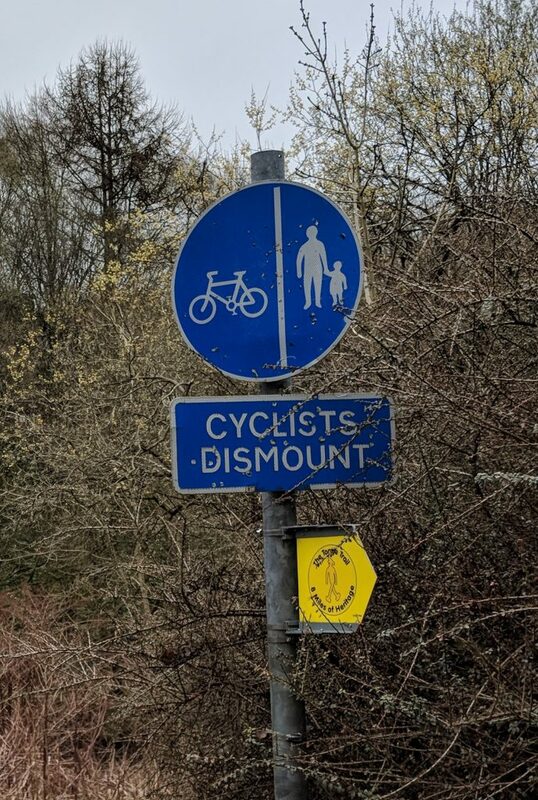 I have to admit that I got a small amount of satisfaction from pointing out that my wife and I do a lot of walking around Bolton because she, who would need to use a tricycle to ride due to balance issues, is too afraid to ride on Bolton’s toxic roads. A look at the rest of the tables in that article shows more than a 15% decline in the proportion of people cycling to work compared to the previous census 10 years earlier. It is not difficult to see the reason for that decline. In November 2014 I looked at Bolton Council’s most recent “Cycling Strategy”, which had been published in February 2006, and saw that the route I was riding each day to work and back (in Salford) was designated as an “existing cycle route”. I had always felt that it could be no accident that the road I used for most of that journey was designated the A666; it was, and still is, an absolutely appalling route. Unfortunately, it was the only realistic choice I had for making that journey, due in part to the huge barrier created by the M60 motorway passing through the north of Salford (a concept that turned out to be a key element of the method used for the meeting). 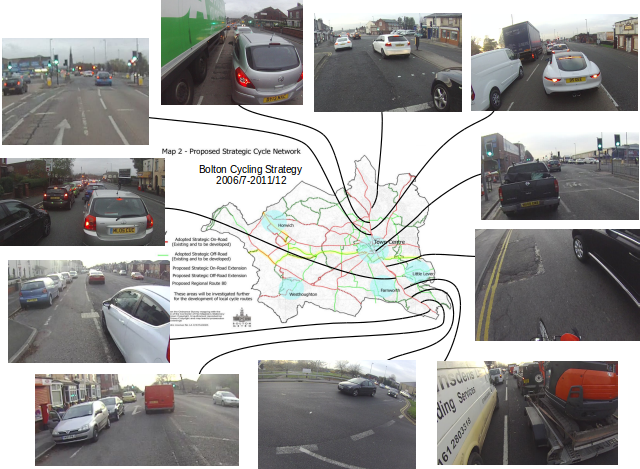 So, at that time, I created the following graphic showing typical road conditions at various points along the route and presented it to the Bolton Cycle Forum. Conditions like these can in no way be considered conducive to everyday cycling, which is why I saw very few fellow cycle users on my journeys to and from work. 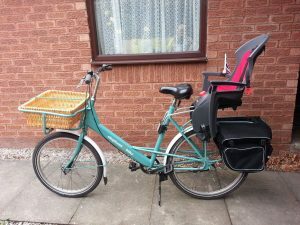 As an ilustration of the effect of this environment, my granddaughter and I used to love using my elephant bike with a child seat to go to places. When we weren’t chatting, she would sing at the top of her voice as we went along. 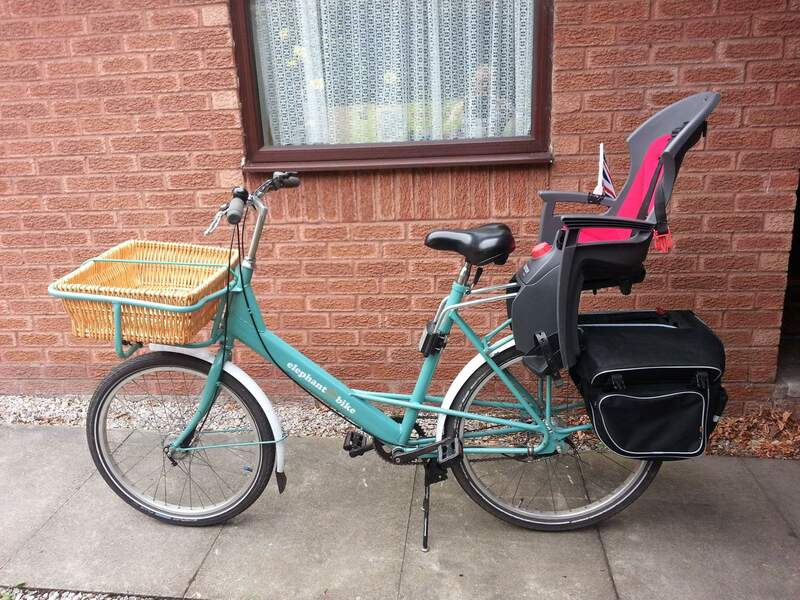 Unfortunately, at the age of 6, she got too big for the seat last summer, and I am too afraid to ride on our roads with her on the tagalong, so she has already been robbed of something she loved thanks to the toxic roads and streets of Bolton. I don’t mind admitting that this makes me more than a bit angry. Sadly, the roads I showed above are typical of the experience of cycling anywhere in the Bolton borough and very little has changed since then. 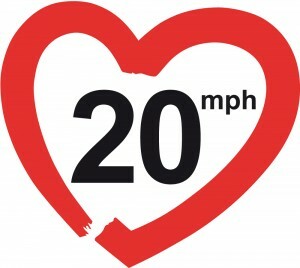 The attitude at the council just seems to be business as usual, so it will be interesting to see whether the authority can be enthused by what is the most exciting development for active travel in Greater Manchester; or possibly anywhere in the country outside of London. One of the concerns that I had prior to the meeting was the emphasis that seems to be placed on using canal towpaths and disused railway lines as cycle facilities. This is something that had come up earlier in the year at an event organised by the Greater Manchester Mayor, Andy Burnham, and the messages coming through were not, in my opinion, good ones. Whilst there is nothing wrong with making use of these routes, it does not solve the problem of enabling people to get to the places they need to go to, at all times of the day and night, in all conditions. Of the places that I go to myself by bicycle, not a single one is located on a canal or a disused railway line, and this probably applies to most people. Here, the red mark is located in the area where I live. (I’ve not placed it too near our home for security and privacy reasons.) The magenta marks show destinations that I have been to at least once carrying my granddaughter in her child seat, including her school. The most distant ones are in Manchester, which is about 15 miles each way. 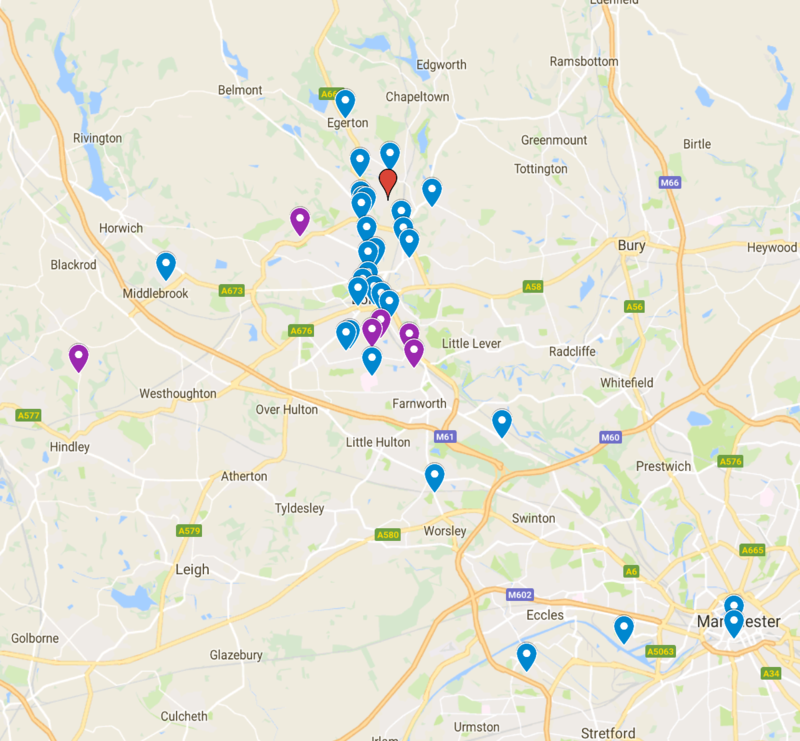 These destinations include the doctor’s surgery, the dentist, the hospital, shops and supermarkets, Bolton market, relatives’ homes, other shops (e.g. 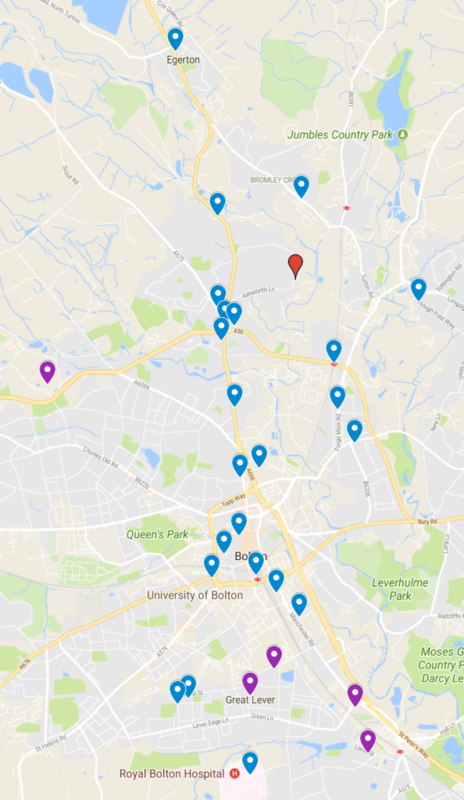 Screwfix and Maplin), my granddaughter’s school, restaurants, takeaways, pubs, railway stations and parks, and most of them are located on or near to main roads. Whilst they are scattered all over the town, there is, as it happens, a high concentration along the dreadful “strategic cycle route” that I showed earlier. The meeting was run very effectively by Brian Deegan, according to a clear methodology that is described very well by Nick Hubble in his write up of the Bury meeting, and it is well worth reading that article (or at least that part of it) before continuing. We started by sticking together a number of large map sheets to make a very big map of the whole borough, set out on a table. We were initially asked by Brian to use red marker pens to mark all the barriers to active travel that we could identify across the borough. Unfortunately, I, and I suspect most of the participants in the meeting, misunderstood what was being asked of us and started marking sections of road that are particularly hostile for cycling. It was only much later that I, at least, realized we were being asked to mark barriers in the sense of the M60 motorway I mentioned earlier; barriers that separate one area from another, making it hard to move between those areas, rather than roads as existing throughfares that are difficult to use. Similarly, we needed to mark rivers, railway lines, and anything else that forms a line that is, or might be, hard to cross. In Bolton, that even includes edges that separate areas at different levels, though that issue became apparent (for me) quite late in the process. In Bolton, it is easy to get the impression that the town is relatively flat, with just a few gentle hills here and there, albeit with hilly areas wrapped around the northern and eastern sides. However, this is an illusion created by the fact that quite deep valleys are spanned by bridges on all of the major thoroughfares, giving the impression of flatness to anyone who doesn’t go off the beaten track. The valleys are still there, but they are mostly hidden behind buildings and walls. So effective is the illusion that, for example, anyone using Blackburn Road, part of that A666 route to the north, would think that they are travelling over slightly undulating ground. They would be very surprised to look over the high parapet of Astley Bridge, which has buildings and a back street on the other side of the road, to see that there is something like an 80 foot drop down to the river below. This is one aspect that showed very clearly the value of having people with good local knowledge at the meeting. The next step, as in the Bury meeting, was to mark (in green) sensible places to make provision so that people can more easily cross the barriers from one area to another both on foot and by bicycle, as well as existing points (in blue) where such provision is made and places where the existing provision needs to be improved. In addition, routes that need work to provide access to those crossing points were marked in dashed green. The premise seems to be that, as well as natural barriers to movement, humans have created many other barriers, effectively clogging up the landscape and preventing movement. The exercise, then, is to open up the borough to make it permeable again so that people can move more freely from place to place. This “zone-based” thinking makes a lot of sense; in fact it seems more obvious the more I think about it. It gets us away from the restriction of thinking that the existing thoroughfares are the only ones available; “route-based” thinking. However, it is not clear to me yet exactly how this relates to existing routes, which really should not be ignored. In the map that I showed earlier, most of the destinations are on or very near to the major roads, and the current barriers to cycling to those destinations are caused by the poor design of those roads. Using alternative routes that are off the main roads is often not practical because the existing (road) routes have already engineered out barriers like the steep-sided valleys I mentioned earlier. If you don’t use the main roads, Bolton becomes an extremely hilly place indeed! In the end, a large proportion of the crossing points marked on the map were just the major junctions between A roads, which are, without exception, very hostile to cyclists, and always prioritise motor vehicle movements over pedestrian movements. Perhaps, though, this is where the route-based thinking and the zone-based thinking come together. This is the point at which we switched, quite abruptly, from zone-based thinking to route based thinking. The task was to identify major routes that we felt ought to have serious investment to support walking and particularly cycling along them; the sort of thing that in London is (rather unfortunately, it turns out) called a Cycle Superhighway. Not surprisingly, suggestions were mostly from people who already had specific routes in mind and we could all be accused of riding our own particular hobby horses. However, I do think the five examples that were discussed all have merits. The first proposal was a route along a disused railway line that goes from close to Bolton Station, via Daubhill, out towards Westhoughton. There was a lot of discussion of this possibility, including part of the history of the railway line, and it is indeed a good idea. Most of the route of the original railway is still available, and the route takes in Hulton Park, where Peel Holdings recently received planning approval to go ahead with a major development including a golf course, hotel and over 1000 new homes; a decision that has been very controversial as the site is designated as green belt land. It has been my own view that the construction of such a cycle route should have been made a condition of this planning permission, but that’s a different story. It was considered that such a facility would be considered a “greenway” route rather than an urban route, but it was looked on favourably and marked in dashed green pen. The second suggestion was my own, which was to create a cycleway down the A666 Blackburn Road from the boundary north of Egerton through to the town centre. Now, I can’t deny that I have personal reasons for wanting to see that route dealt with, and the reasons are very clear if you look at the second destinations map I showed above. Having said, that, I really do think that is a very good route to concentrate on as it is extremely congested with motor traffic in the morning and evening rush hour. As a consequence of that congestion, there have been heated arguments about whether a “bypass” should be created to extend St Peter’s Way, the main throughfare into Bolton from the south, through to a point just below Egerton on that map. I intend to write another article about that as I am far from convinced that a bypass (or probably more accurately a relief road) is required, but I do believe that making good provision for cycling and walking could have a big impact on relieving the congestion. Unfortunately the impression was given by some of the councillors present that nothing can be done about providing for cycling and walking until a bypass is built. I was very disappointed to hear the view expressed (yet again) that traffic must be moved elsewhere to make way for cycling, when what we really need is modal shift away from motoring towards walking and cycling for shorter journeys. It was also pointed out that work was already underway to provide routes from Farnworth through to Radcliffe and to link with the National Cycle Route 6 in the Irwell Valley using canal towpaths, and there was discussion of the importance of addressing these routes as walking routes. In fact, the walking routes do already exist, but are badly in need of maintenance as they are inches deep in mud in places. In the end, a route was marked on the map in dashed green, going from the Irwell Valley up to Darcy Lever, taking in a marked road called Fogg Lane. As an aside, I found this interesting because until about 30 years ago, I used to live in Darcy Lever and often went running along Fogg Lane, which was a fairly well-worn gravel road about 5 metres wide. I happened to try cycling along that road about 2 years ago, and was shocked to find that it was now a very rough, narrow path, about half a metre wide in places, passing through fairly mature trees. How things change. The fourth suggestion was to create a good quality protected cycle way along Chorley New Road from Horwich into Bolton. This was an interesting proposal because the road is mostly a single lane in each direction, despite being very wide, with painted cycle lanes for most of its length. There are issues with lack of provision at junctions, but I can see how most of this route could be improved relatively easily using light segregation, and could provide a “quick win”. This route was also marked in dashed green. The fifth suggestion came from the secretary to our Cycle Forum, who sometimes rides to work in Bolton from Stockport (yes! ), and suggested Manchester Road to the south. This is the other half of the awful “strategic cycle route” that I mentioned earlier, so I was pleased to hear that. It is also a route that has several of my destinations on it, including my granddaughter’s school. It would be truly fantastic to have a protected route from my home to my granddaughter’s school 4.5 miles away, but I am under no illusion that any work will be completed before she is old enough to leave that school and move to secondary school (just over 4 years). However, this suggestion coupled with my own could provide a busy cycle route from the north of the borough all the way to the boundary with Salford in the south, including part of a direct route into Manchester. This is the route that has been marked in black on the map. I find this very pleasing, though it was suggested by Brian that we would be looking at a 20 years timescale for such a route, by which time I will hopefully be approaching my 81st birthday. The last thing that Brian asked us to consider was the idea of turning one of the zones we had identified in the first (red pen) stage into a “mini-Holland” by blocking all through routes for motor traffic but still allowing cyclists and pedestrians to pass through (filtered permeability). This would mean that the only motor traffic on the roads would be for access, and streets would become places for people rather than thoroughfares for motor vehicles. There was some confusion at this point as the meeting was coming to an end, but I think the conclusion was to look at the area between Deane Road and Derby Street/St Helens Road, though I might have that wrong. Overall, Brian was very pleased with the meeting, and we had indeed got through a lot of stuff in three hours, though I suspect we could have done with a few days to really do it justice. However, the team took away the paper map and will be converting that to electronic form for publication, so we will hopefully have the chance to develop it further. This whole initiative is the most exciting development I have seen since I got involved in local cycle campaigning. I was very impressed with the way the meeting was run and it has provided a lot of food for thought. Hopefully this will be the start of a transition from a town that is purely designed for motor transport and continues to be designed this way, as witness the design of our most recent development, the transport interchange, into one that is designed primarily for people. If this does not happen, then I can’t see how the severe decline that is apparent in and around the town centre will ever be turned around. 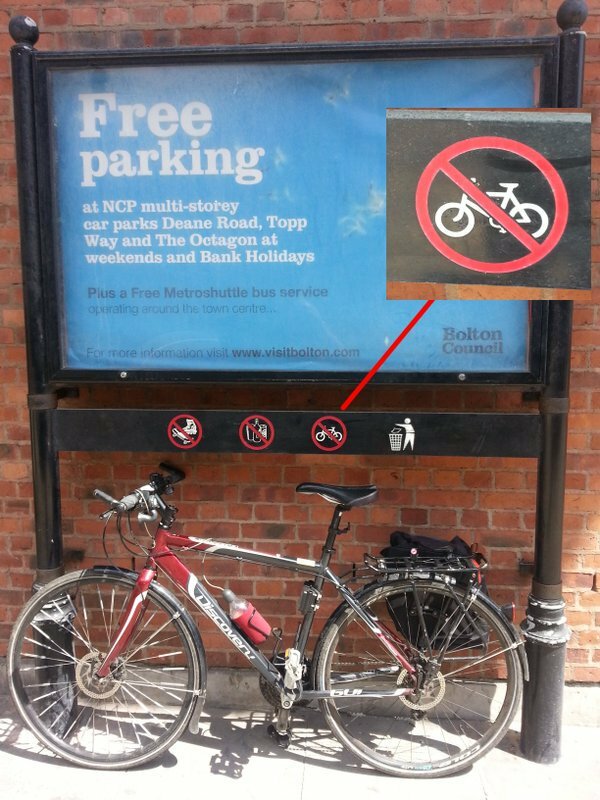 This entry was posted in Article, Bolton, Space for Cycling. Bookmark the permalink.